Gerrymandering appears to be one of the most definitive electoral issues in the history of the United States. It has become a staple of political manipulation since the beginning of partisan politics. 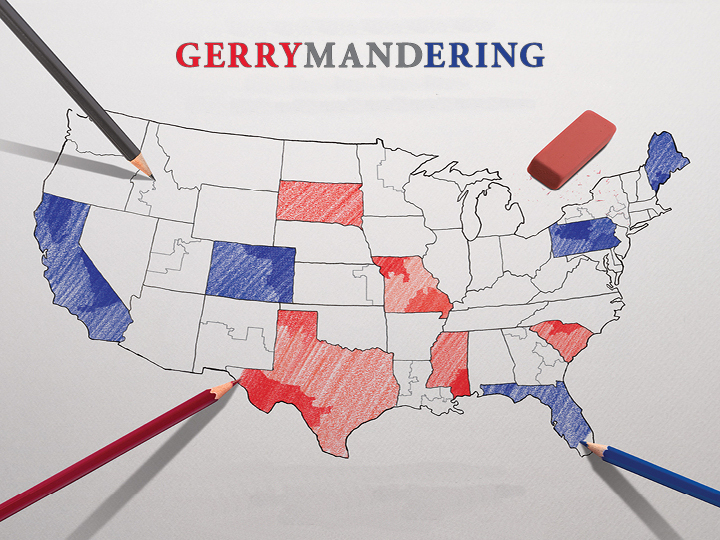 Gerrymandering is defined by the Merriam-Webster Dictionary as a political method to divide a territory into specific election districts giving one political party an electoral majority in a large number of districts while concentrating the voting strength of the opposition in as few districts as possible. Now, in 2018 and possibly beyond, the method of biased redistricting could start to see its end. This year, the Supreme Court of the United States will be hearing three major cases from states Maryland, Texas, North Carolina, Virginia, Michigan, and Wisconsin about redrawing electoral district lines at the state and local level. These cases are happening in the wake of the recent rulings related to the redistricting cases in Pennsylvania and current efforts to abolish gerrymandering nationwide. This is not the first time the Supreme Court has heard such an issue. In 2004, in Vieth v. Jubelirer, five justices did not want to get involved with a Pennsylvania case that alleged partisan gerrymandering, because there was no apparent standard or method to legally judge it. Fourteen years later, in 2018, the court refused to hear an appeal case from Republican officials where the Democratic majority Pennsylvania State Supreme Court ruled that the federal congressional district lines were unconstitutional. Politically liberal undergraduate students at The Catholic University of America in Washington, D.C., expressed concerns regarding the process. Other students on campus from Pennsylvania shared similar sentiments. “Gerrymandering is one of, if not the, most potent threat to American democracy,” said senior politics major Joseph D’Antonio from West Chester. Conservative students from Pennsylvania criticize the process, but they had mixed views when it came to the Pennsylvania case. “This was an unprecedented ruling by the court, one that is actually unconstitutional as the state legislature is the body responsible for drawing the maps,” said junior politics major Westyn Krol from Pittsburgh. Another student from Pennsylvania expressed similar statements regarding gerrymandering in his home state. “I am a believer in ending political gerrymandering, regardless of the party,” said junior politics major Matthew Schargel from Doylestown. “What happened in Pennsylvania, however, was an abuse of power by the judiciary and I think by implementing the map for 2018, they disadvantaged Republicans and the voters of Pennsylvania all together. I think the map will ultimately be ‘fair’ but the way they went about it was not.” Conservative students from Maryland, have also been critical of gerrymandering. While states try to settle this process in federal courts, other jurisdictions such as California and Arizona have managed to implement independent redistricting commissions to redraw both state and federal lines every ten years after the conduction of the federal census. While the Supreme Court is expected to rule on these cases before the end of its term, a recent bipartisan poll conducted by Democratic researcher Celinda Lake and Republican analyst Ashlee Rich Stephenson from the Campaign Legal Center shows that more than 70% of Americans want to see the Court rule that partisan gerrymandering is unconstitutional. Good description of an important anti democracy problem.